A bracelet of pink-and-cream blooms borders Lake Michigan at this time of year. Growing up from barren, sandy areas, Pitcher’s thistle (Cirsium pitcheri) is like an oasis for nearby insects looking for nectar. Helpful pollinators visit the plants often, but not nearly enough to offset the damage of the predatory visitors, according to Garden scientists, who hope to tip the balance in order to save the federally threatened plant species. 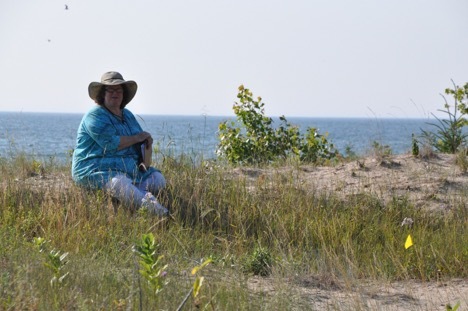 It all began in 1997, when Kay Havens, Ph.D., joined a team of researchers to reintroduce Pitcher’s thistle to Illinois Beach State Park. But she wondered why a reintroduction was needed for a normally sturdy group of plants. 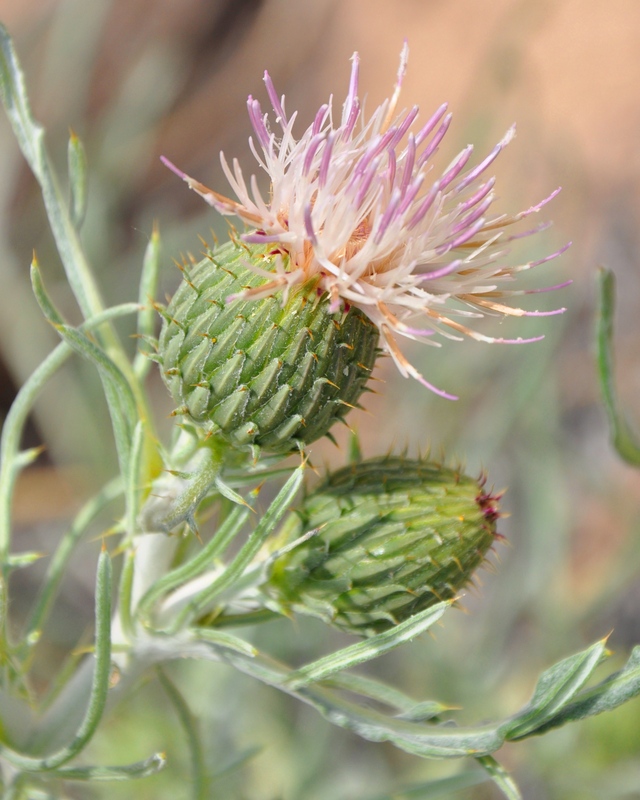 “Thistles as a group are typically pretty successful, even weedy, and it’s unusual to have a native thistle that is so rare,” said Dr. Havens, Medard and Elizabeth Welch director of plant science and conservation at the Garden. Along with her Garden colleague, Pati Vitt, Ph.D., she found the plant is especially susceptible to a species of weevil (Larinus planus) whose larvae feast on emerging seeds. 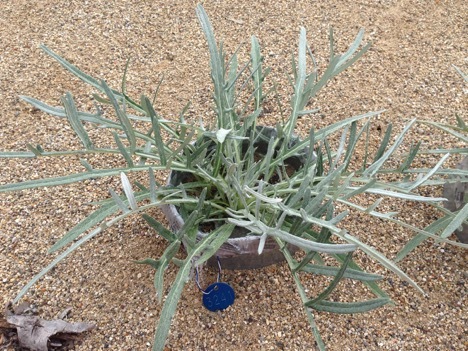 Unfortunately, if a blooming thistle loses its seeds before they are dispersed, new plants cannot be started. “We were the first to document the weevil in this threatened thistle,” said Havens. 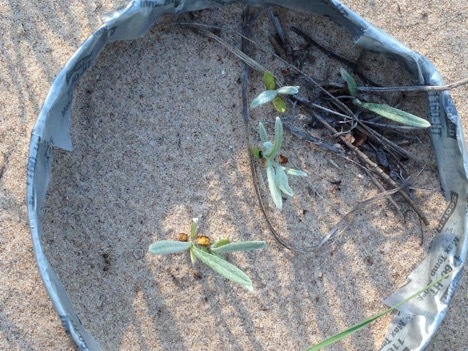 “If we don’t find a way to control it, the plant is further threatened with extinction.” This discovery was followed by the identification of a second, equally destructive weevil (Rhinocyllus conicus) in Indiana Dunes State Park. “The weevils have become very widespread in Pitcher’s thistle and they cut the seed output by about half,” said Havens. 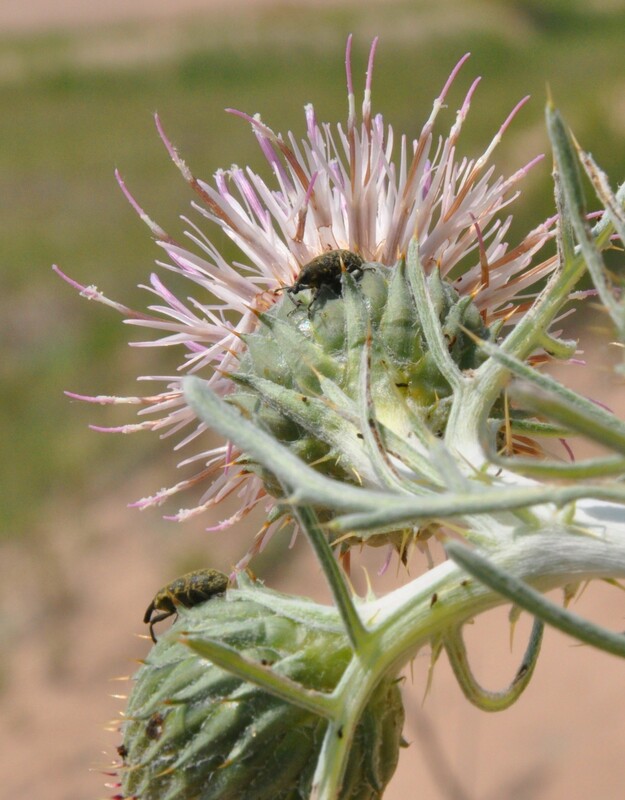 Both insect species, she explained, are biocontrol weevils that were intentionally scattered in the area for years in an effort to control the invasive Canada thistle (Cirsium arvense). Now, the damaging insects are off the list of solutions for Canada thistle. As we talked, it was clear that this rescue team is not willing to accept defeat from a 7-millimeter bug. For years, they have been hard at work gathering information to help them arm the thistle against its adversary, and theorizing potential solutions. Pitcher’s thistle lives four to eight years, and only blooms once, the conservation scientists told me. And they are also working to better understand the remarkable plant that has a custom set of strategies, like all plant species, to survive and reproduce. “Every species represents a unique solution to an entire suite of environmental problems,” said Dr. Vitt, Susan and Roger Stone curator of the Dixon National Tallgrass Prairie Seed Bank at the Garden. These solutions, she explained, could solve large-scale problems for people or other species in ways we don’t yet know. “The species has intrinsic value because it has these unique solutions that evolved over hundreds of thousands of years,” she added. 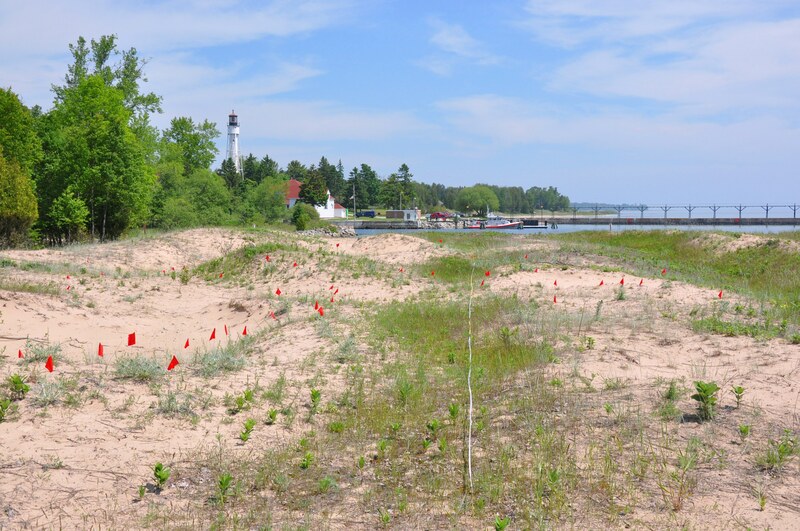 This summer, Havens and Vitt spent weeks in Door County, Wisconsin, observing the interactions of the weevil with Pitcher’s thistle, as well as those of its suite of pollinator species. Watch a video to learn how Havens became interested in plants as a child, and why she says we couldn’t survive without them today. Together with their research team, they recorded detailed notes about the frequency and time of visits by the helpful pollinators, like bees, and the dreaded weevils. In total, they monitored 27 visiting insect species. “We want to find ways to protect this plant from weevils without affecting its pollinators,” said Havens. Could a certain floral scent do the trick? Could a natural insecticide be the answer? Each solution must be carefully tested and put to trial first. For now, they are busy trying to understand the life cycle of the weevil as it relates to the thistle—from the time an adult lays its eggs in the seedhead to the time the larvae emerge from the flower and eat the seeds that could have been the next generation of plants. As I left Havens and Vitt in the Daniel F. and Ada L. Rice Plant Conservation Science Center, they were sorting through their samples of seedheads and weevils, collected in the field, and musing over the potential solutions planted by their research that are just beginning to grow.